The enhanced G Suite App allows you to monitor and analyze activities across all G Suite applications and G Suite Alert Center. Comprehensive dashboards display information about administrative and user activities, Google Drive usage, and logins. Dashboards also provide full visibility into alerts from G Suite Alert Center, allowing you to monitor, investigate and correlate alerts across all G Suite activity. 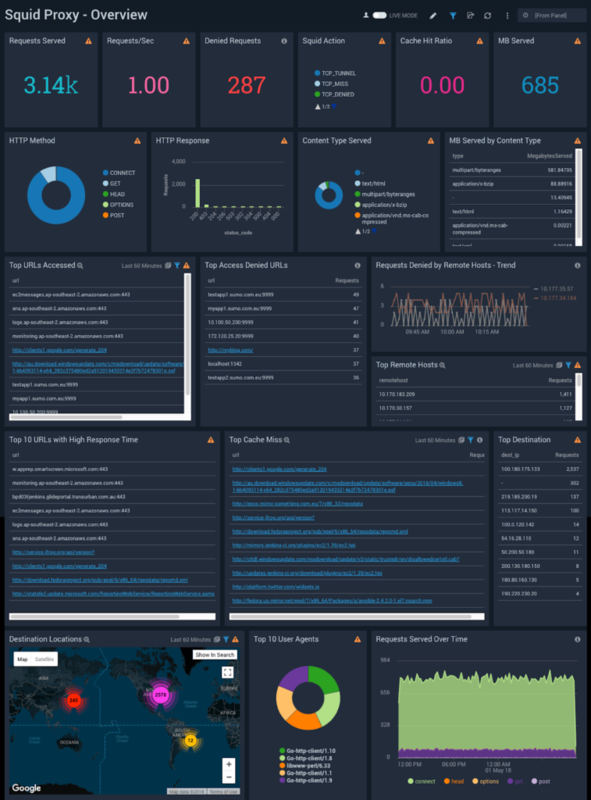 The Opsgenie App provides at-a-glance views and detailed analytics for alerts on your DevOps environment, allowing you to effectively monitor and gain valuable insights into your incidents and incident handling operations. The IIS App monitors the performance and reliability of your Microsoft Internet Information Services (IIS) infrastructure, identifying customer-facing and internal operational issues. This app also provides the ability to monitor customer paths and interactions, so you can analyze how customers are using your applications. 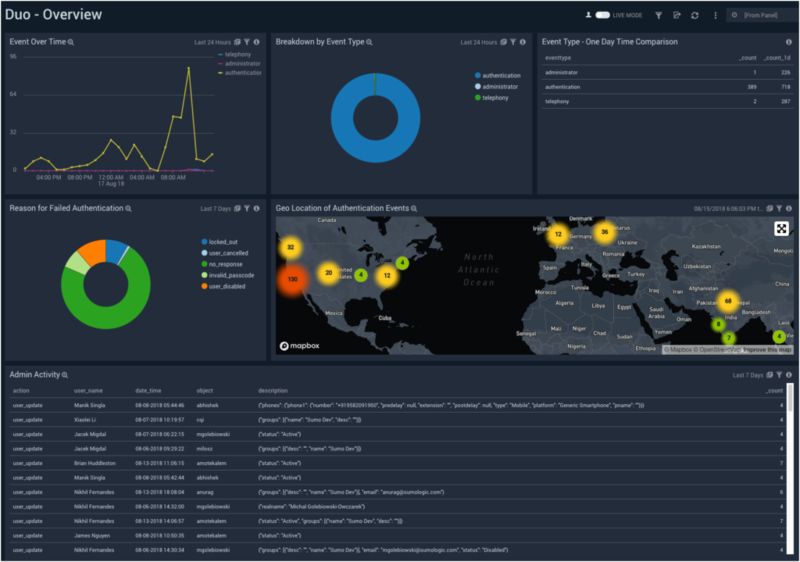 The Cylance App enables you to analyze Cylance security events by type, status, and detection method. 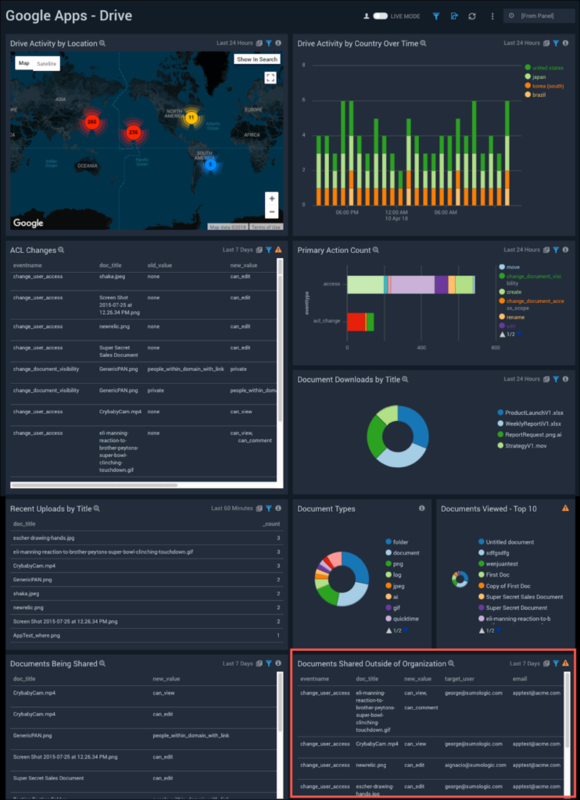 You can use the App to investigate Cylance-specific events and provide operational visibility to team members without logging into Cylance. The Netskope App provides visibility into the security posture of your applications and helps you determine the overall usage of software and SaaS applications.Netskope is a Cloud Access Security Broker (CASB) hosted in the cloud. The Netskope product is primarily used for enforcing security policies for cloud-based resources, such as Box and Microsoft Office 365. 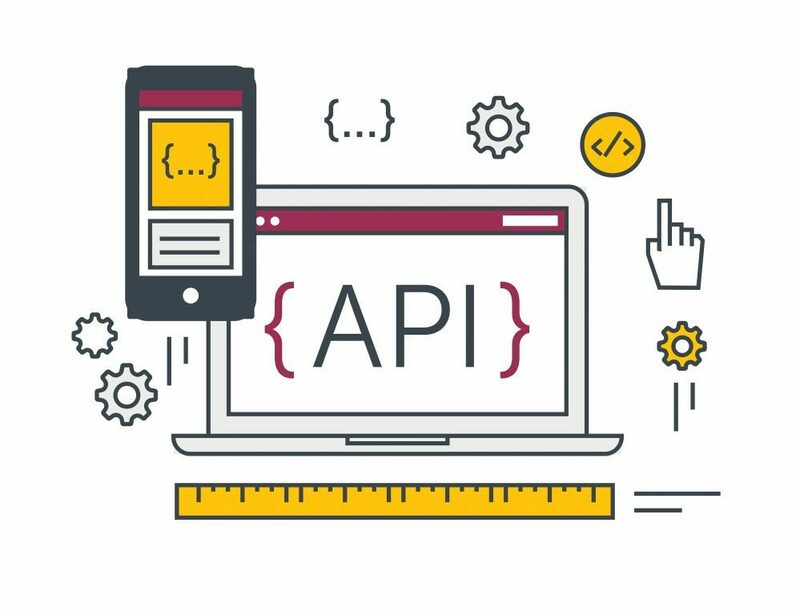 This new set of User and Role Management APIs allows customers to programmatically create and manage users and roles, thereby making it easy to integrate Sumo into existing company onboarding and offboarding workflows. 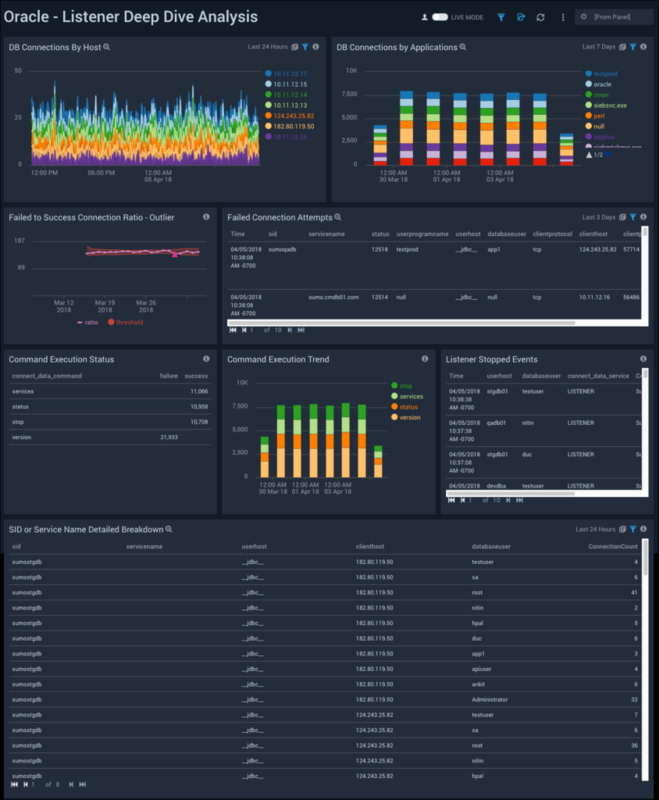 The Sumo Logic App for VMware collects unified logs and metrics (ULM) from the VMware cloud computing virtualization platform, including vCenter Server, vSphere, ESX/ESXi, and individual virtual machines, for real-time display in predefined dashboards. 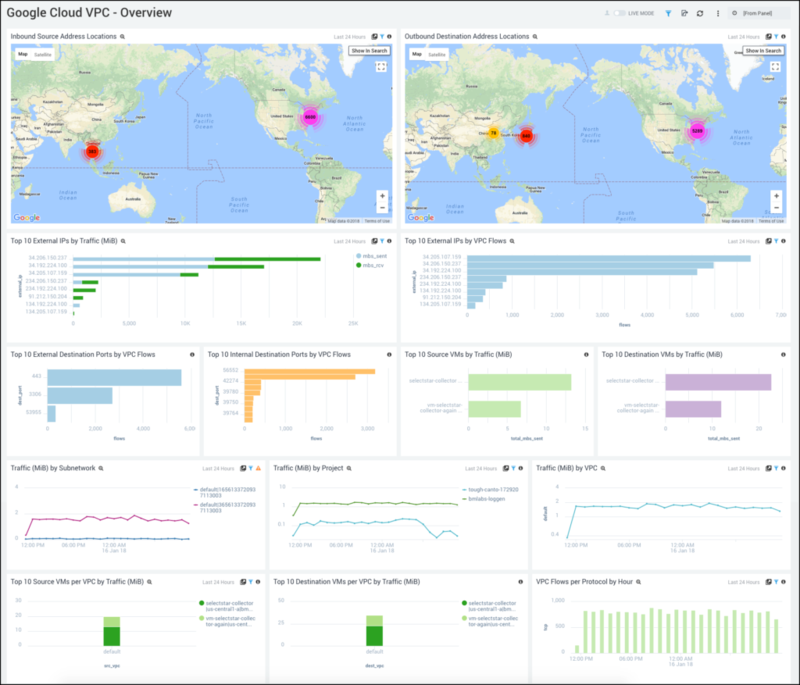 The dashboards allow you to monitor your entire VMware cloud computing virtualization platform, with insight into key events and metrics such as VM CPU, memory, disk utilization, under-provisioned physical hosts, and idle VMs. This enables you to determine capacity constraints and troubleshoot operational issues related to over-provisioning, changes to configuration, and VM movement. 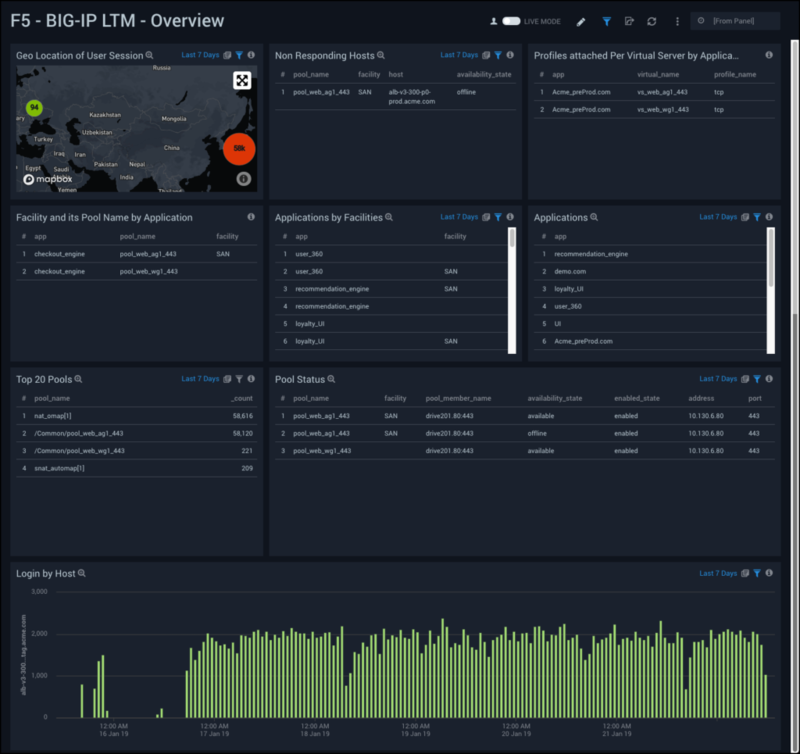 The Sumo Logic App for F5 BIG-IP Local Traffic Manager (LTM) helps you optimize and secure network traffic patterns coming into your data center using the F5 BIG-IP platform. 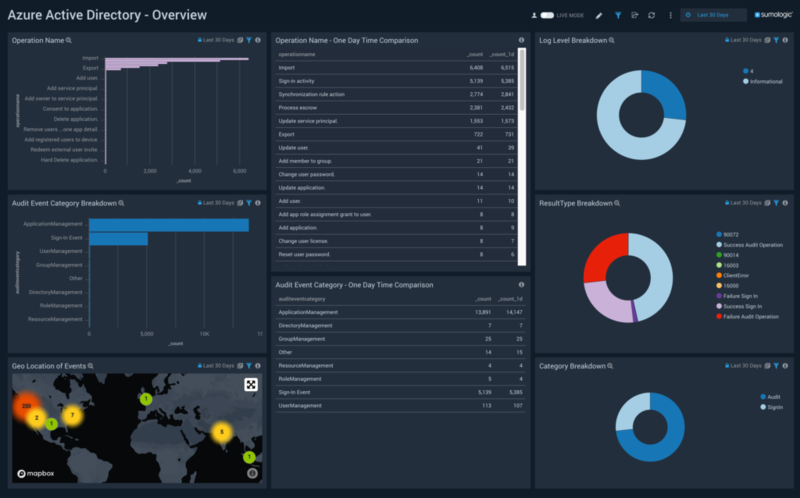 This App analyzes traffic flowing through the F5 Local Traffic Manager (LTM) and automatically detects threats using Sumo Logic Threat Intel. 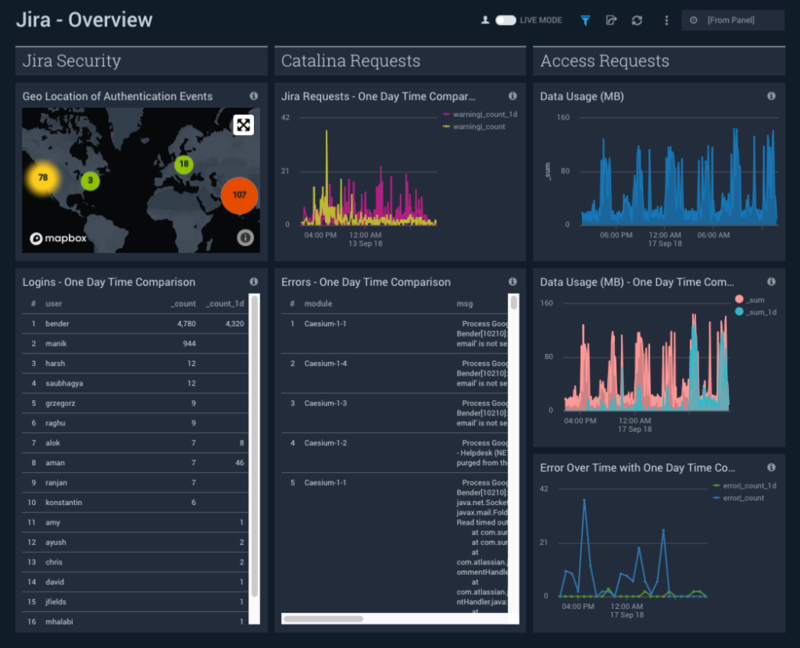 The App provides pre-configured dashboards that allow you to monitor traffic details by application, facility, pool, active and non-responding hosts, connections, and logins. It also reports LTM CPU, disk usage, and outliers in LTM activities and traffic patterns. Metrics now supports Single Value Charts. A single value metric chart is useful for summarizing a time series in a single value, and making that value stand out at a glance. 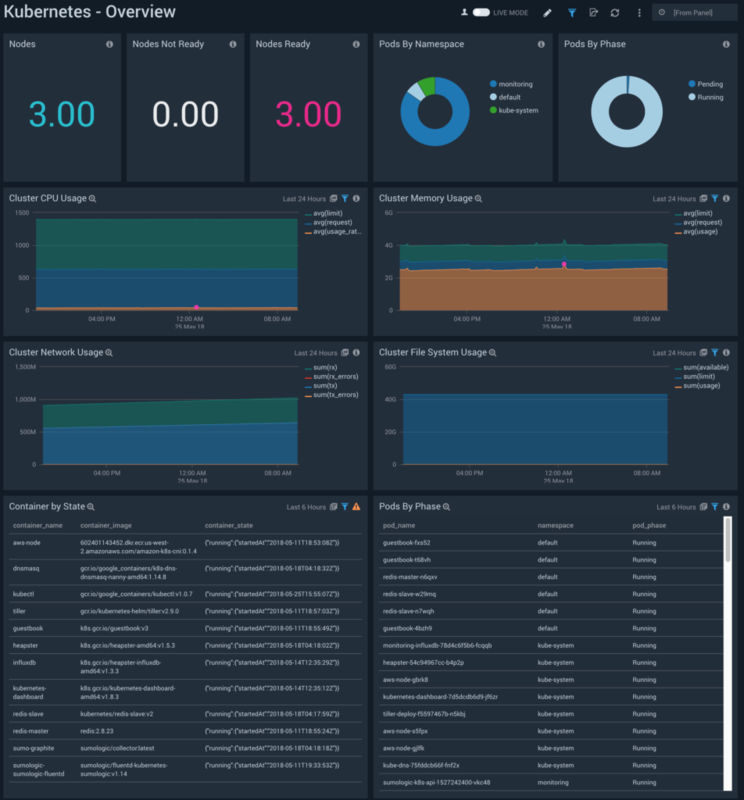 The Sumo Logic App for PagerDuty V2 collects incident messages from your PagerDuty account via a webhook, and displays incident data in pre-configured Dashboards that allow you to monitor and analyze the activity of your PagerDuty account and Services. The Sumo Logic App for PagerDuty V2 uses Webhooks V2, to provide enhanced context for alert object models. Azure Active Directory is a cloud-based directory and identity management service that provides directory services, application access management, and identity protection. The Sumo Logic App for Azure helps you monitor activity in the Azure Active Directory. 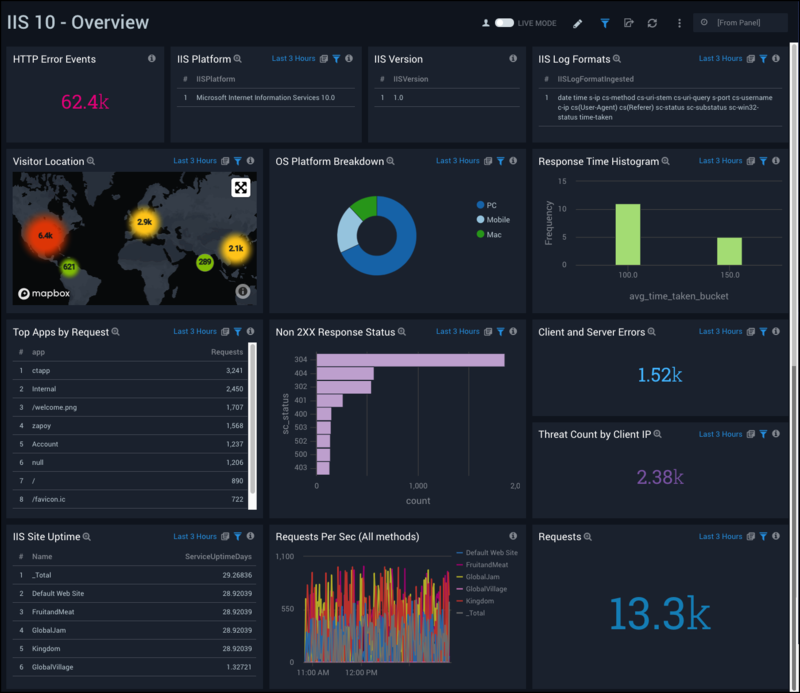 The dashboards provide insight into role management, user management, group management, successful and failed sign-in events, directory management, and application management data that helps you understand your users’ experience. Aurora MySQL ULM is a unified logs and metrics (ULM) app for your Aurora MySQL database. 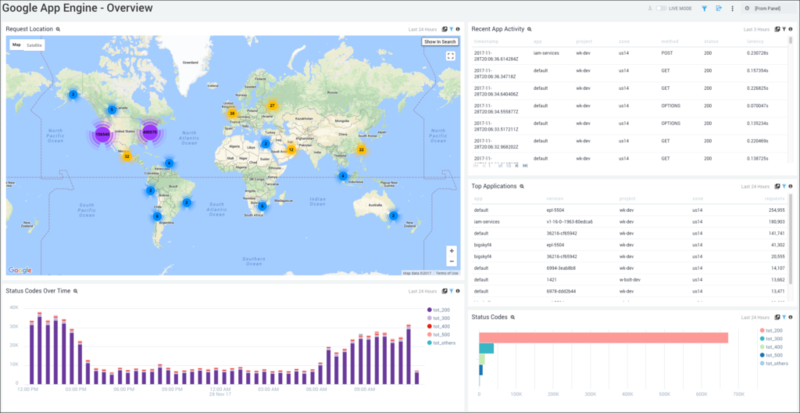 The app allows you to monitor slow queries executing on the database, the number of connections made, identify users, client hosts, and client locations used to connect to database. 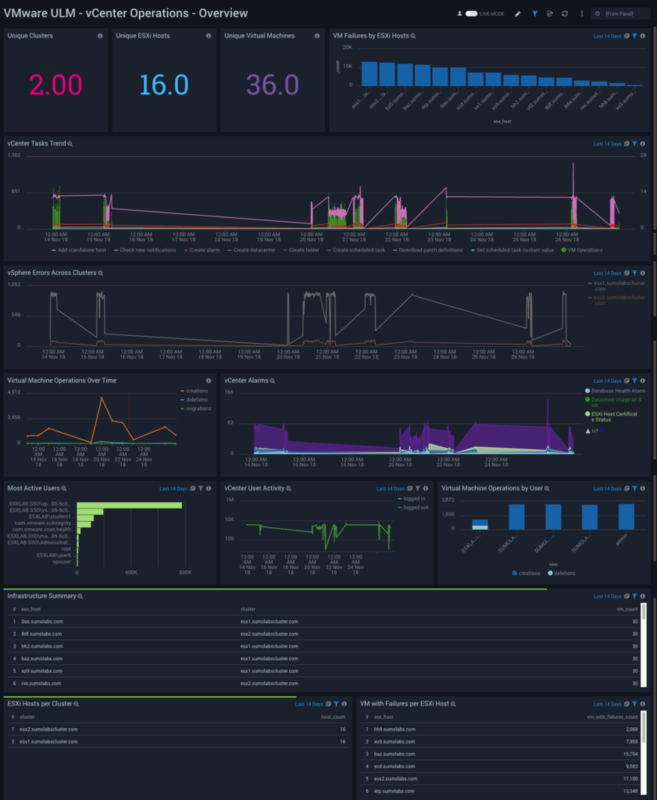 The app also provides insights for queries executed per second, CPU utilization, free memory, network utilization, volume read and write IOPS, replica lags, latency, throughput, failed login / connection attempts, and other health and performance related data. 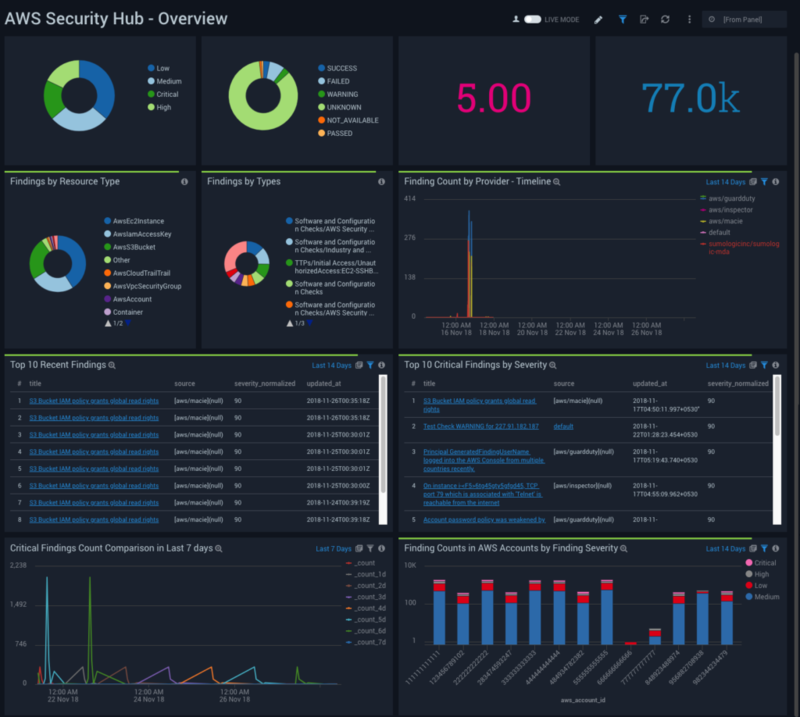 The Sumo Logic App for AWS Security Hub leverages findings data from Security Hub and visually displays security state data in Dashboards. 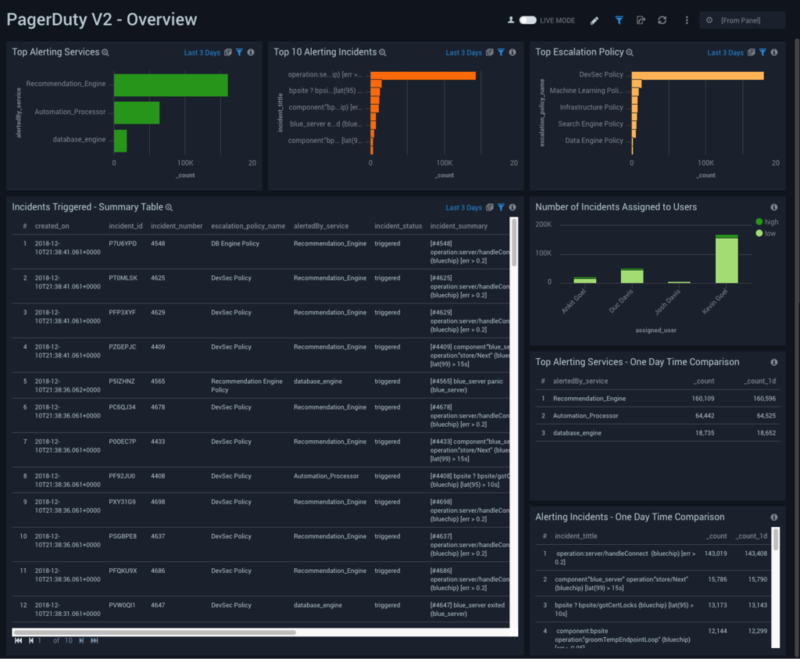 The dashboards provide a high-level view of findings, showing the type, when they occurred, the resources that were affected, their severity, and their distribution, showing the current security and compliance status of an aws account from all sources. 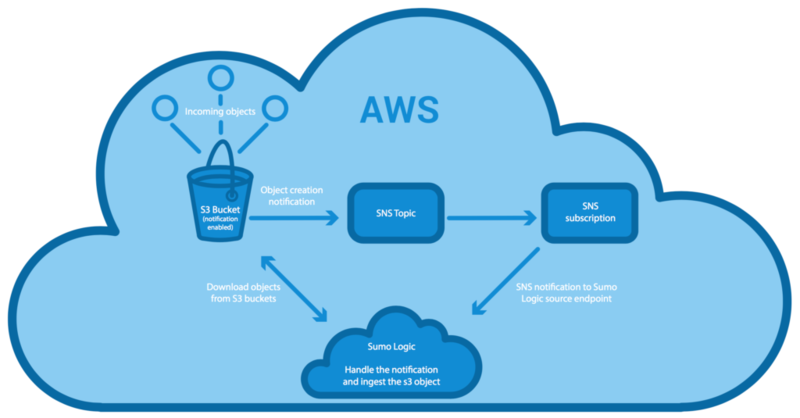 An update to the Sumo Logic App Amazon VPC Flow Logs was released today. The updated app supports a new collection method. You can now Collect Amazon VPC Flow Logs using AWS S3 Source. The alternative Lambda-based collection method is enhanced: you can filter internal traffic logs, and customize your VPC flow logs with the following AWS attributes: vpc-id, subnet-id, aws-region, security-group-ids, and direction. The updated app also includes a new “Security Groups” dashboard. Aurora PostgreSQL ULM is a unified logs and metrics (ULM) app for your Aurora PostgreSQL database. The app allows you to monitor the number of connections made, CPU utilization, free memory, network utilization, volume read / write IOPS, disk queue depth, replica lags, latency, throughput and other resource utilization details. 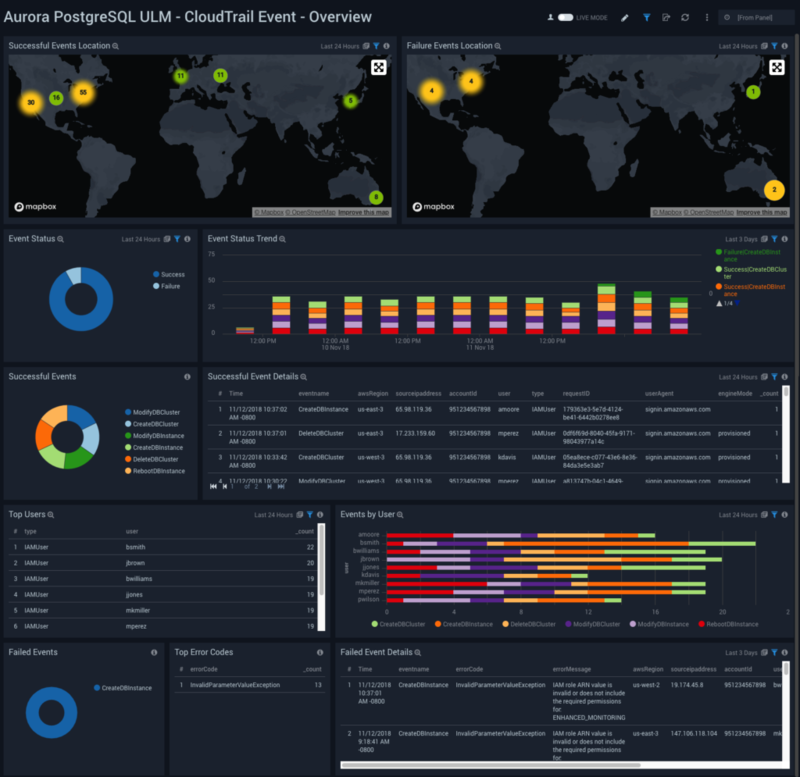 With Cloudtrail logs, the app allows you to identify user, client host and client locations being used to configure Aurora PostgreSQL infrastructure. Sumo’s HTTP source now supports the Prometheus format, so you can ingest Prometheus metrics directly into Sumo Logic. We’ve also released a handy open source tool for sending Prometheus-formatted metrics to Sumo Logic. Google Cloud Platform (GCP) firewall rules let you allow or deny traffic to and from VMs in a Google VPC network. The Sumo Logic app for Google Cloud Firewall helps you monitor request activity and the effect of your firewall rules. 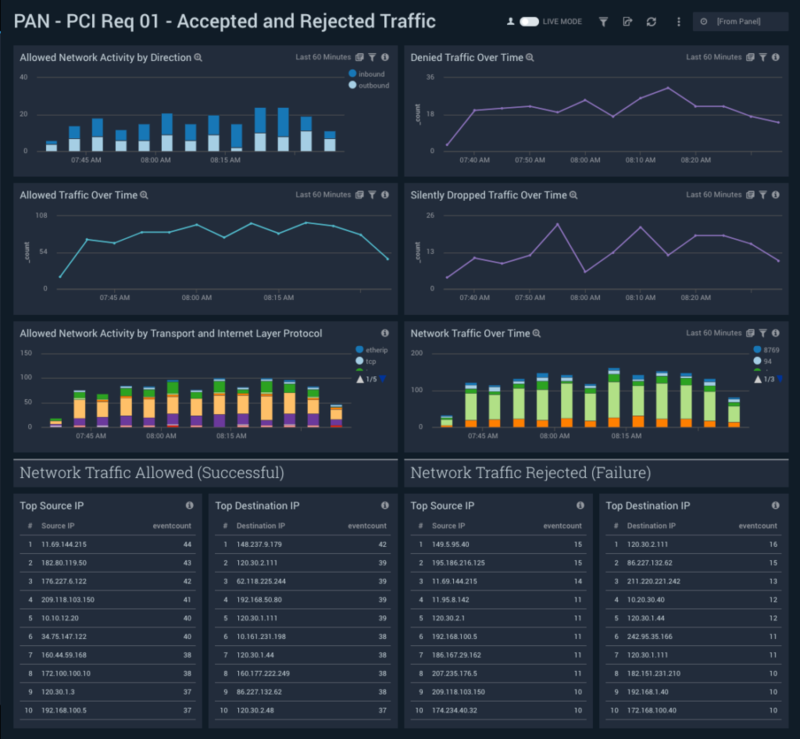 The preconfigured dashboards provide insight into ingress and egress request traffic, including the location of allowed and denied requests, allowed and denied requests over time, and the top networks, subnetworks, and VMs by allowed and denied ingress requests. The Sumo Logic App for PostgreSQL is a unified logs and metrics app for monitoring your PostgreSQL database. 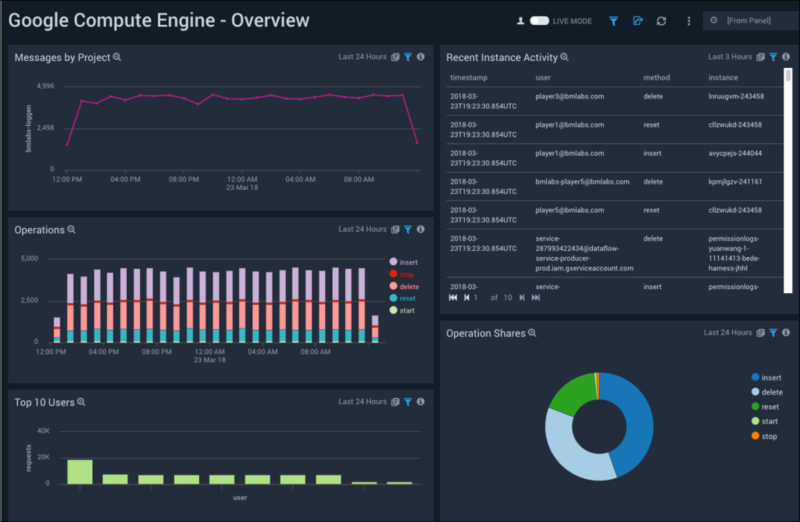 The app provides operational insights into the PostgreSQL database—installed on your local hardware—for real time analysis, helping you to troubleshoot issues before they become serious problems. The Sumo Logic App for Jira provides insight into Jira usage, request activity, issues, security, sprint events, and user events. 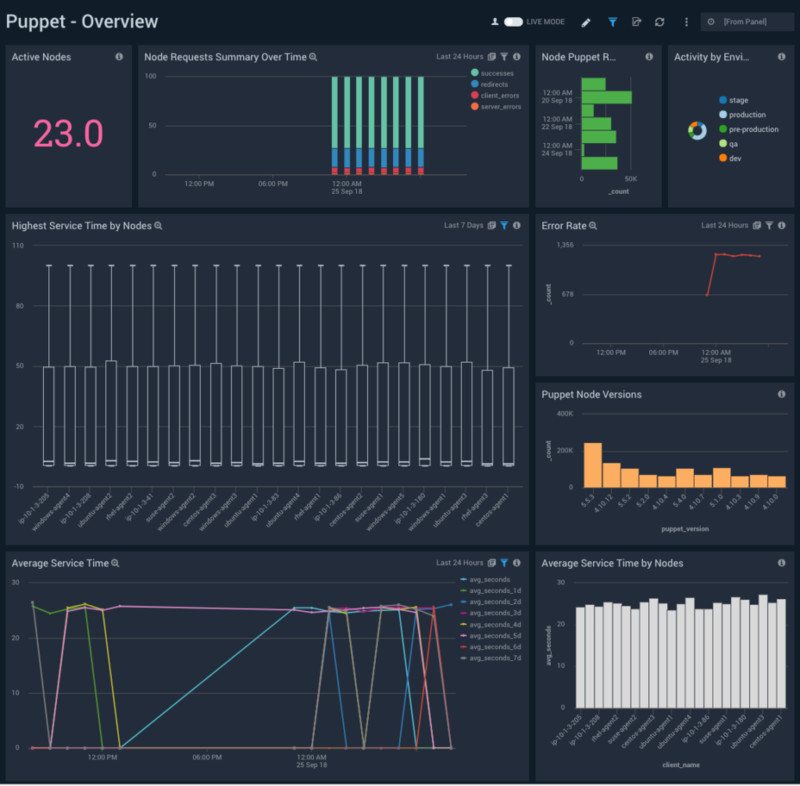 The Sumo Logic App for Puppet helps you monitor Puppet metrics and events, which means that you can easily determine when Puppet runs occurred.Track service and applying times for each run.Find out how often resources have changed, skipped, failed to update, or are out-of-sync.Find out the root cause of issues by correlating puppet runs with metrics from other components in your infrastructure. 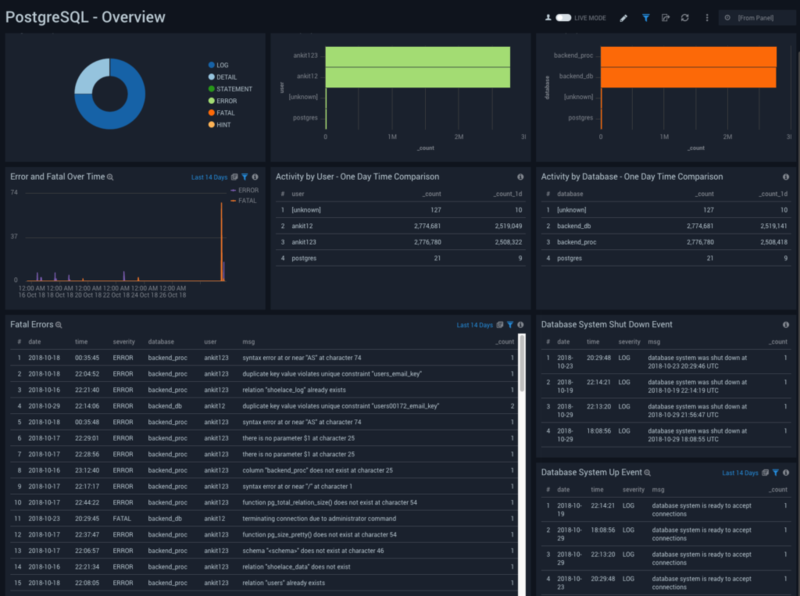 The Sumo Logic App for Payment Card Industry (PCI) Compliance for Palo Alto Networks offers dashboards to monitor firewall traffic activity for compliance with PCI requirements 01, 02, and 04. Palo Alto Networks (PAN) 8 provides a next generation firewall and the Traps Endpoint Security Manager. 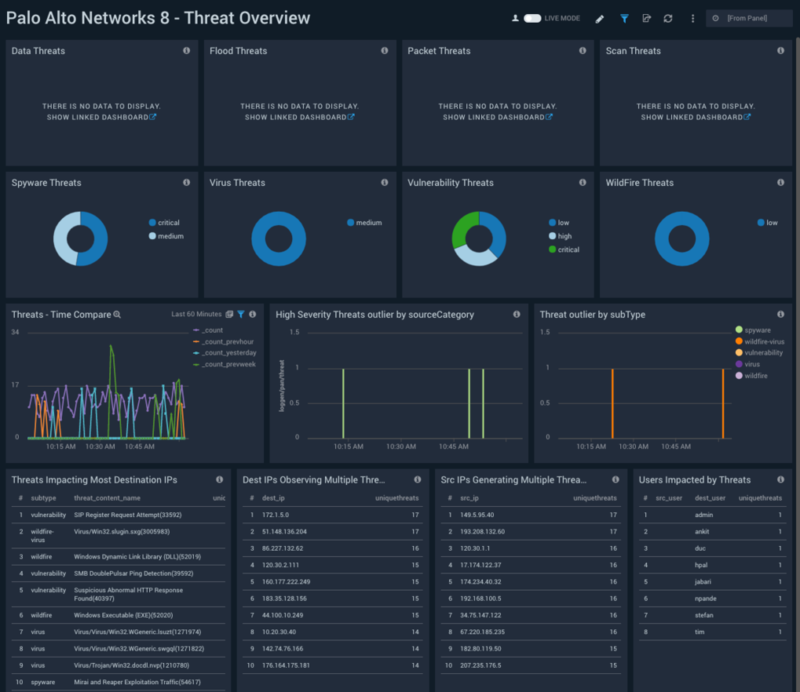 The Sumo Logic app for Palo Alto Networks 8 gives you visibility into firewall and traps activity, including information about firewall configuration changes, details about rejected and accepted firewall traffic, traffic events that match the Correlation Objects and Security Profiles you have configured in PAN, and events logged by the Traps Endpoint Security Manager. 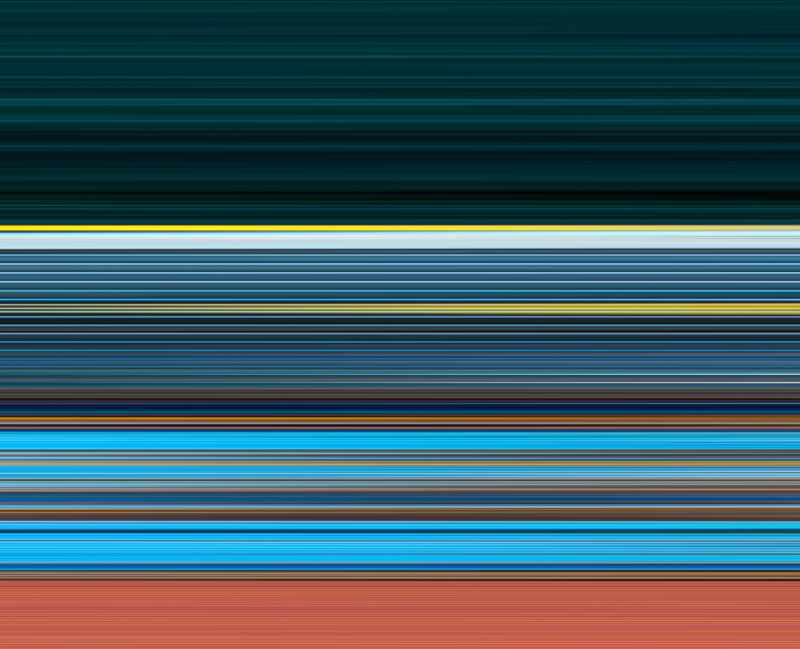 High Performance Analytics: Storing data in a time-series database allows for lightning fast query times, since the data is optimized for speed and efficiency. Thirteen-Month Data Retention: For all metrics, Sumo Logic provides 13-month retention by default, enabling quick long-term trending of critical business and operational KPIs. Flexible and Low Latency Alerting: With metrics, you can leverage Sumo Logic’s real-time metrics alerting engine, which includes intuitive UI configuration, multiple threshold settings, missing data alerts, muting and more. Never Re-Instrument Code Again: Gain all of the benefits of metrics without digging into your code to configure a metrics output. Sumo Notebooks provide a way to seamlessly access data stored in Sumo Logic for the purpose of data exploration and statistical analysis. The notebooks provide an interactive way to gain and share insights of a dataset. 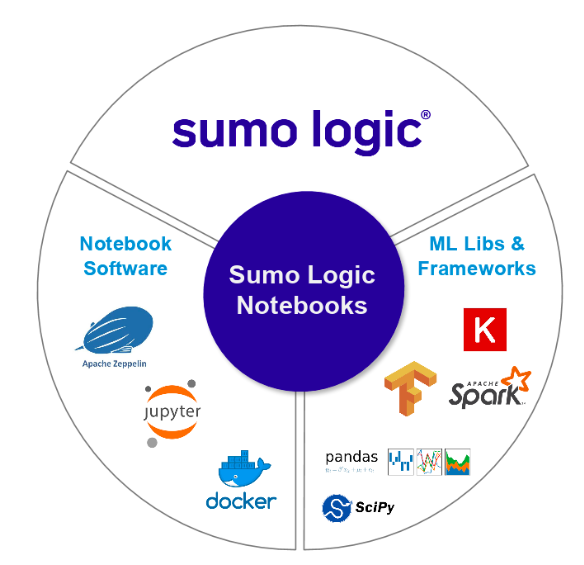 Built on top of Apache Zeppelin and Jupyter, Sumo Notebooks provide a state-of-the-art user experience coupled with access to the most recent machine learning frameworks such as Apache Spark, TensorFlow and other tools to unlock the value of machine data. AWS Web Application Firewall (WAF) is a web application firewall that helps protect your web applications from common web exploits that could affect application availability, compromise security, or consume excessive resources. 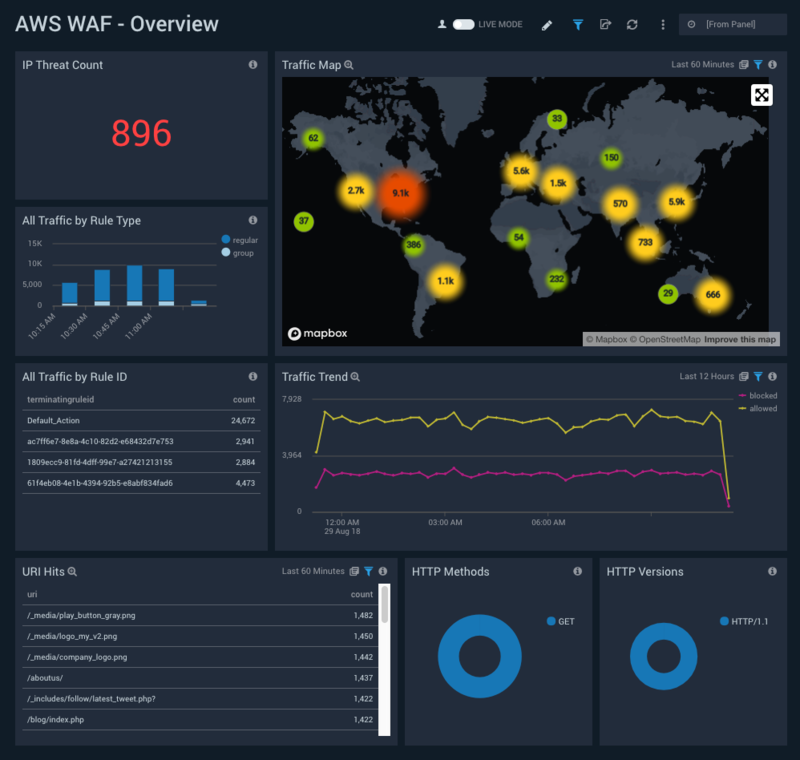 The Sumo Logic App for AWS WAF analyzes traffic flowing through AWS WAF and automatically detects threats via Sumo Logic Threat Intel. 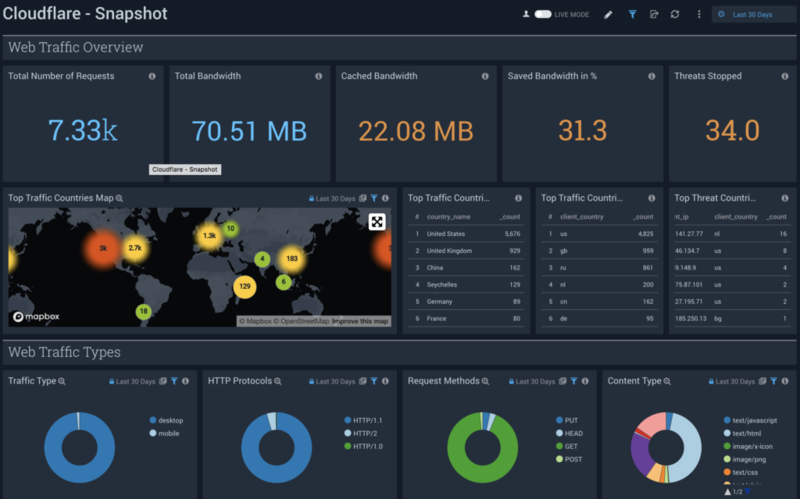 The App provides pre-configured dashboards and searches that allow you to monitor threat and traffic details by client IP, allowed and blocked traffic, malicious IPs, threat actors, location, rules configured, trends and more. S3 Event Notifications with AWS Sources is a new addition to Sumo’s S3 integration which combines scan-based discovery and event-based discovery into a unified integration that gives you the ability to maintain a low-latency while collecting logs from S3 and provides assurances that no data was missed or dropped. When you enable event-based notifications, S3 automatically notifies Sumo Logic that new files are added. The new Subquery operator allows a user create complex filtering conditions within the same query. It’s also valuable when you don’t know the necessary data to restrict the scope of the query, but another query could return the right conditions. For example if CrowdStrike identifies a threat, you can correlate the time of that attack with your Windows Events from the time of that threat. The Sumo Puppet module downloads the sumo logic collector agent from the Internet and installs the Sumo Collector agent. The module also allows sources to be created during installation and updated afterwards. Currently, the module only supports the installation of latest collector version. Duo Security provides two-factor authentication, endpoint remediation, and secure single sign-on tools. The Sumo Logic App for Duo Security helps you monitor your Duo account’s authentication logs, administrator logs, and telephony logs. 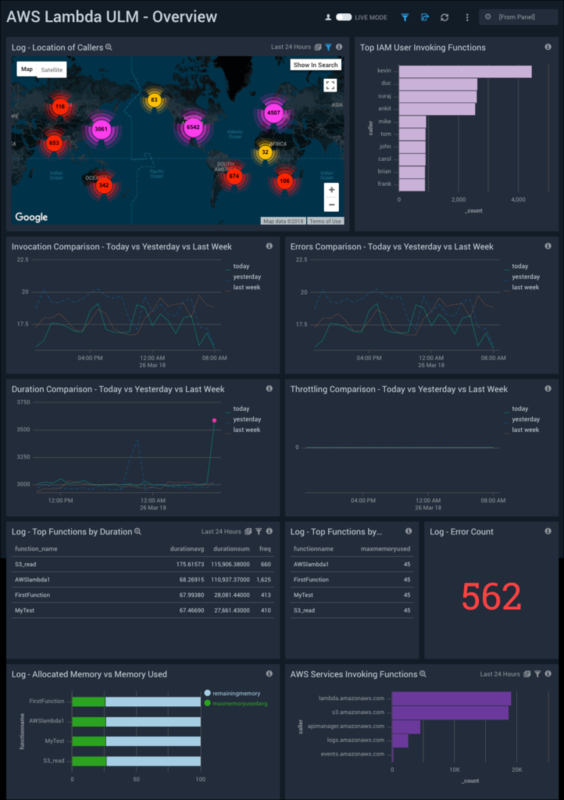 The dashboards provide insight into failed and successful authentications, events breakdown by applications, factors, and users, geo-location of events, admin activities, outliers, threat analysis of authentication, and administrator events. The Sumo Logic Terraform provider enables better automation of Hosted Collector and Source creation. Jenkins is an open source automation server for automating tasks related to building, testing, and delivering software. The Sumo Logic App for Jenkins helps you monitor build successes, failures, and performance. 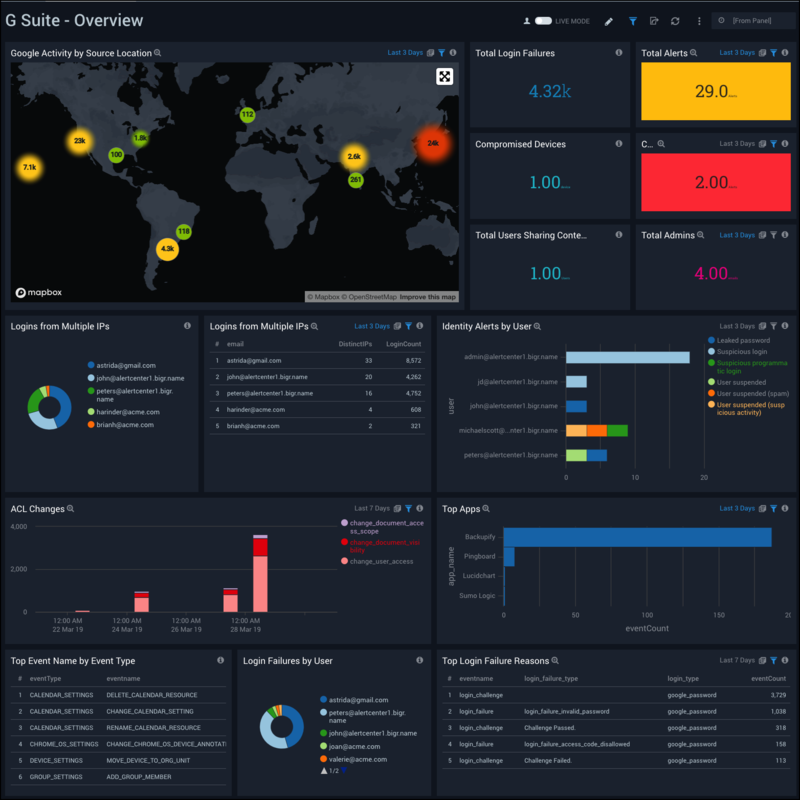 The preconfigured dashboards provide insight into current current and recent build activity. Azure SQL Database is a managed relational cloud database service. 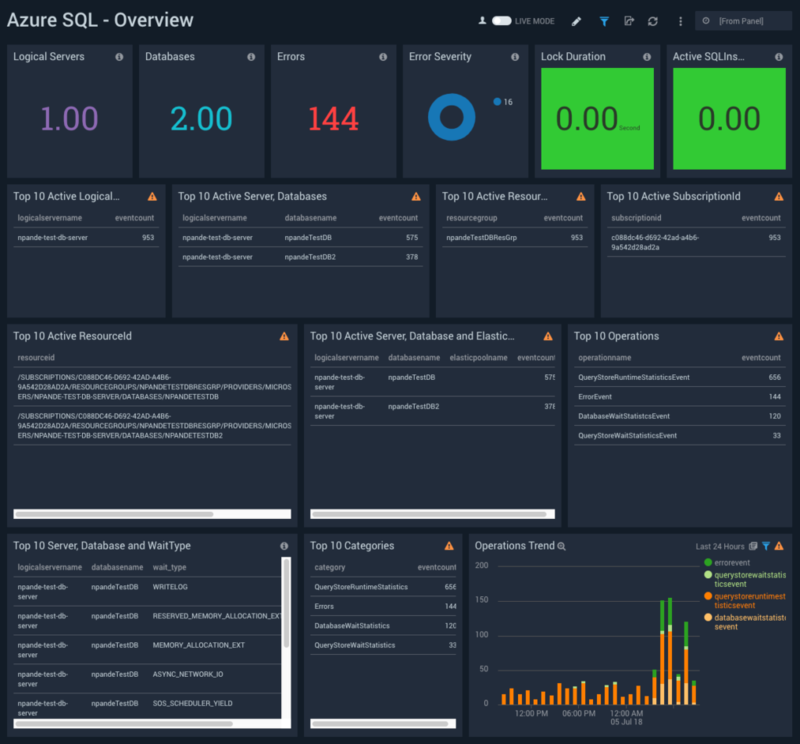 The Sumo Logic app for Azure SQL helps you monitor activity in Azure SQL. 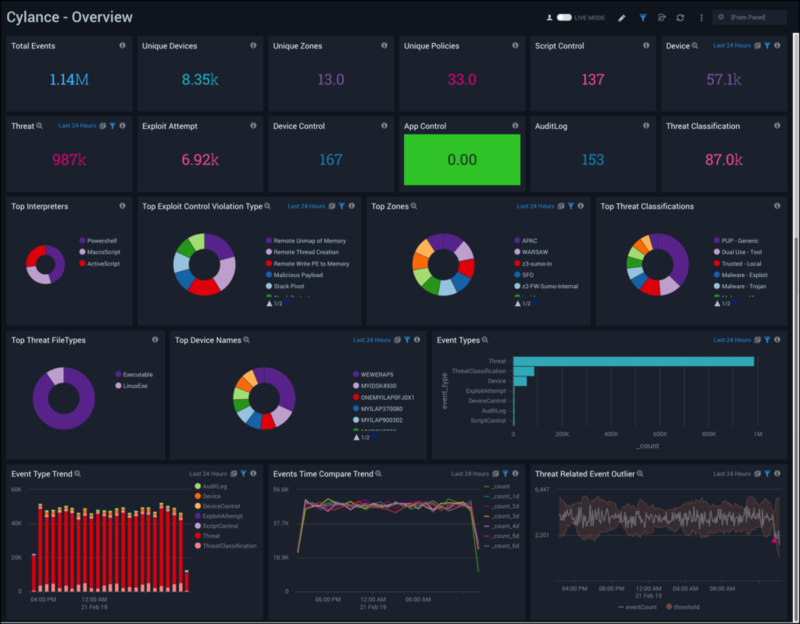 The preconfigured dashboards provide insight into resource utilization, blocking queries, database wait events, errors, runtime execution stats, and other database analytics. Our Docker Stats source collects metrics about the the Docker Containers. This provides visibility into resource consumption of Docker containers. Historically these have been ingested as logs however now we support ingesting this data in the Carbon 2.0 metric format. The Sumo Logic App for AWS EKS allows you to monitor Kubernetes clusters that are powered by Amazon EKS. 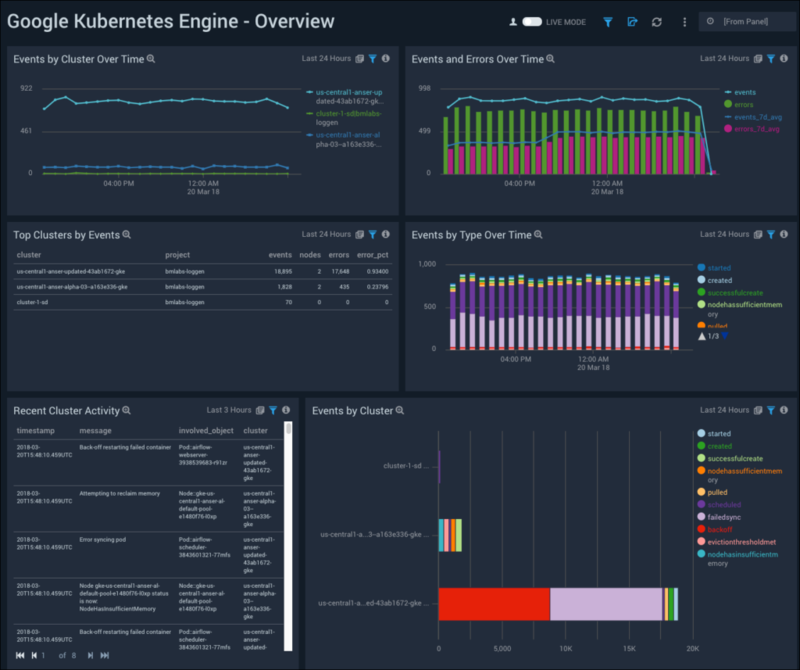 The preconfigured dashboards present resource-related metrics at the Kubernetes pod, cluster, namespace, and node level; and provide operational insight into the state of your Kubernetes cluster. Logs and metrics for most Azure services can be exported to Azure Storage Account as block blobs. 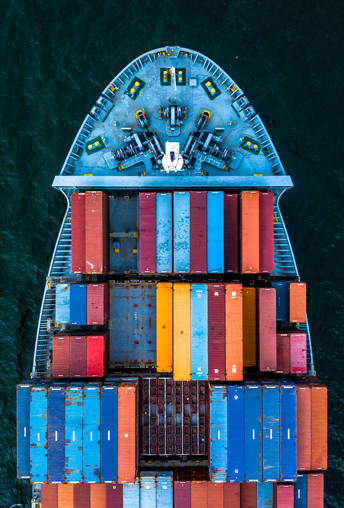 This new Sumo integration provides an event-based pipeline for shipping monitoring data from Azure Blob Storage to an HTTP source on Sumo Logic. This solution is good for monitoring Azure services that do not support exporting logs to Azure Monitor, for example, Azure Web Apps and Azure Storage Accounts. Amazon Redshift is Amazon’s data warehousing service. The Sumo Logic App for Amazon Redshift ULM helps you monitor activity in Amazon Redshift. 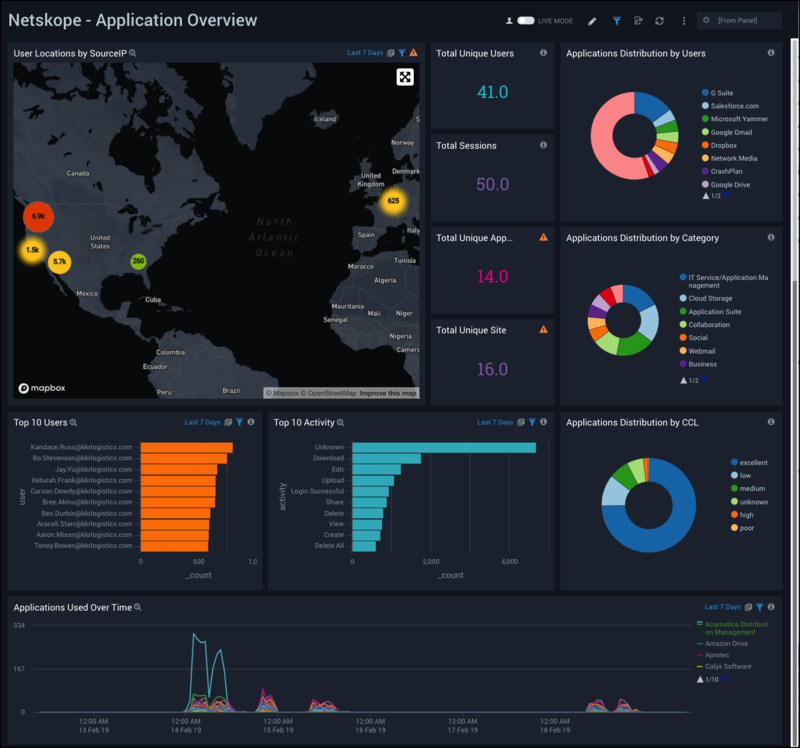 The app is a unified logs and metrics application with preconfigured dashboards provide insight into database connections, SQL command and statement execution, database user account events, CloudTrail events, and resource utilization by node and cluster. Search Templates allows organizations to map their business process and playbooks to Sumo content much more quickly and efficiently in order to accelerate the information discovery and gain insights that help them make better business decisions. The Sumo Logic app for Squid helps you monitor activity in Squid Proxy. 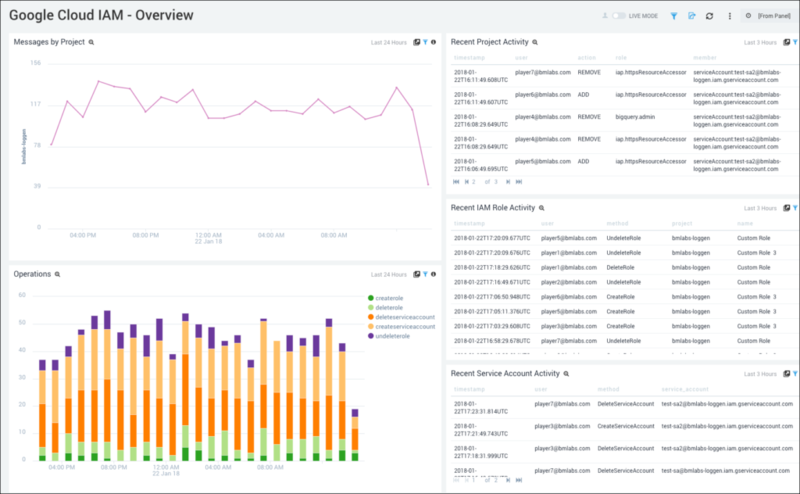 The preconfigured dashboards provide insight into served and denied requests; HTTP response codes; URLS experiencing redirects, client errors, and server errors; and quality of service data that helps you understand your users’ experience. We’ve updated the ability to share commonly used assets such as searches and dashboards in a secure, fine-grained and flexible role-based access control (RBAC) model. Content Sharing allows users to selectively share and collaborate on dashboards and searches with specific users or roles. Administrators can manage dashboard and searches created by other users and highlight key content to specific users and groups. 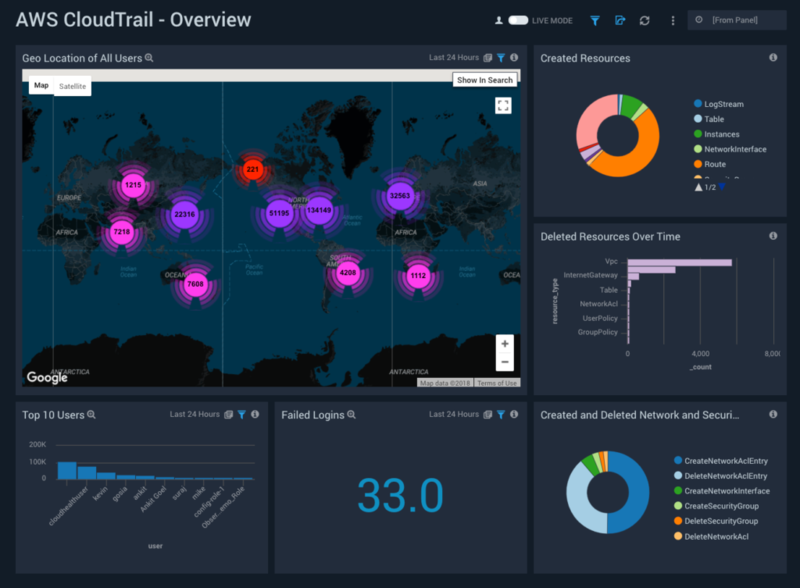 The Sumo Logic App for AWS CloudTrail helps you monitor your AWS deployments, with predefined dashboards that present user and administrator activity, network and security information, CloudTrail console logins, and information about your S3 buckets and public objects. Optimization in the queries and more add-on information to help users monitor effectively. New use cases added to monitor S3 public objects/buckets. The Sumo Logic App for AWS Lambda ULM is a unified logs and metrics (ULM) app that helps you monitor the operational and performance trends in the Lambda functions in your account. Sumo Logic has partnered with Neustar, an industry-leading IP intelligence provider, to deliver a more accurate database for geolocating IP addresses in your log messages. This helps you more confidently detect suspicious logins, maintain regulatory compliance, analyze end-user behavior and more based on the locations of connecting devices. The Sumo Logic App for G Suite allows you to monitor and analyze all of your G Suite apps activity in one place. The predefined dashboards present information about administrative and user activities, drive usage, and logins. This update for Google Suite App provides following features: App supports new log format for G Suite events, new use cases, performance improvements. The Sumo Logic App for Oracle provides insight into the health and activity of your Oracle database. The app consists of predefined dashboards that present information about errors, ORA messages, listener activity, connections, security monitoring, the syslog and XML audit trails and performance monitors from oracle system tables and views. The Sumo Logic app for Google BigQuery helps you monitor data and activity in your BigQuery data warehouse. 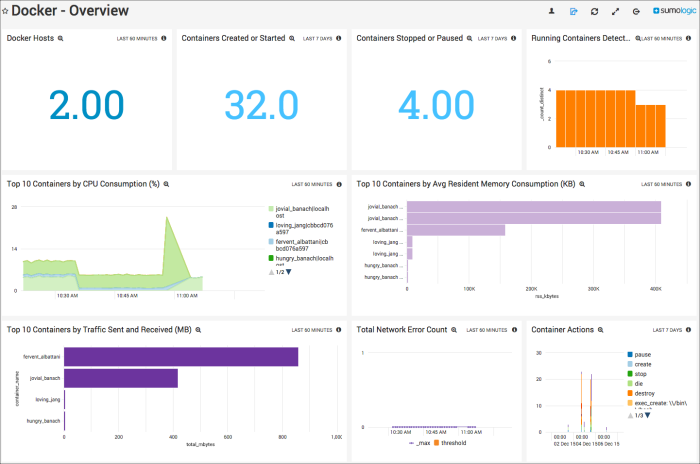 The preconfigured dashboards provide insight into the projects, operations, queries, user management operations, user activities, and billed GBs in BigQuery. The Sumo Logic app for Google Kubernetes Engine helps you monitor activity in Google Kubernetes Engine, providing node-level and pod-level monitoring information. 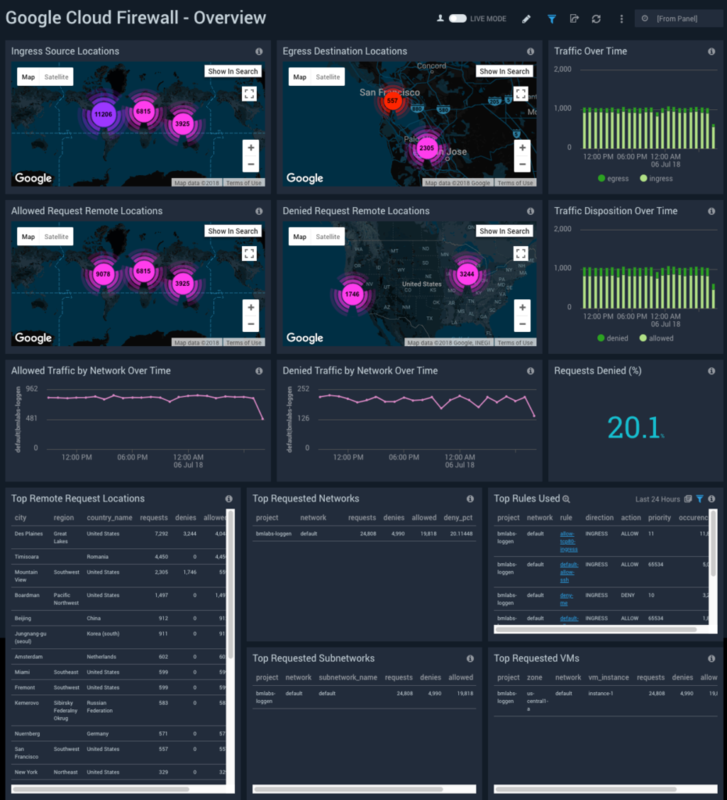 The preconfigured dashboards provide insight into Kubernetes events, errors and activity; pod scheduling; created and killed resources; and severity messages. The Sumo Logic app for Google Cloud Storage helps you monitor activity in Google Cloud Storage. 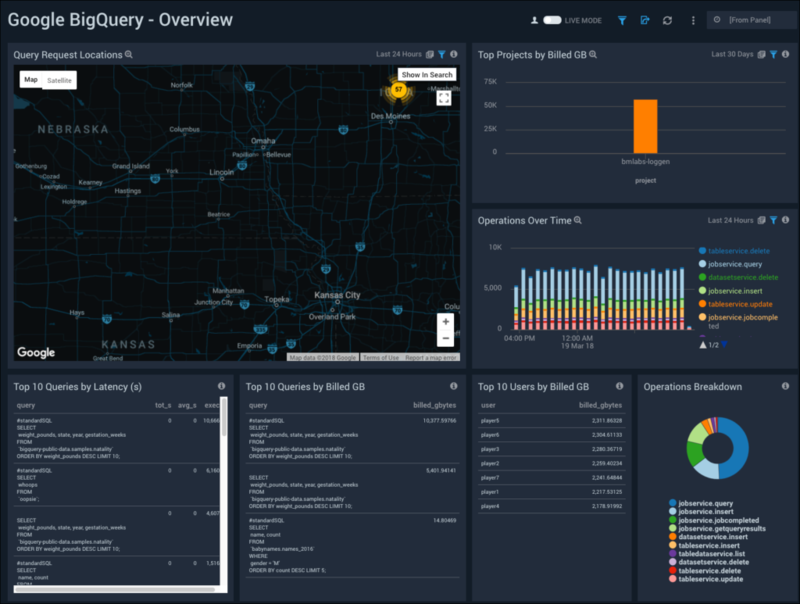 The preconfigured dashboards provide insight into request locations, bucket and object operations, user activities, errors, and bucket statistics. 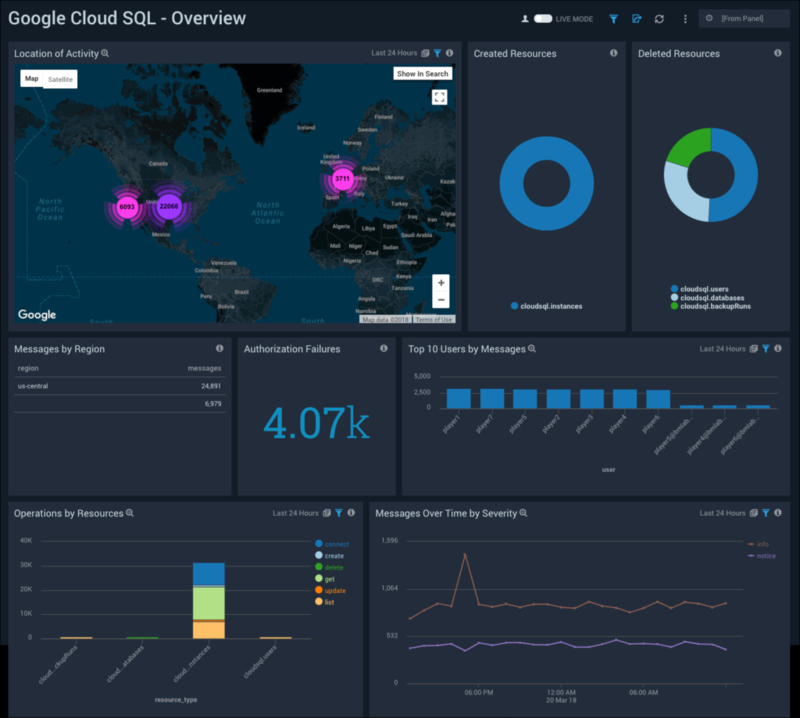 The Sumo Logic app for Google Cloud SQL helps you monitor your usage of Google Cloud SQL. 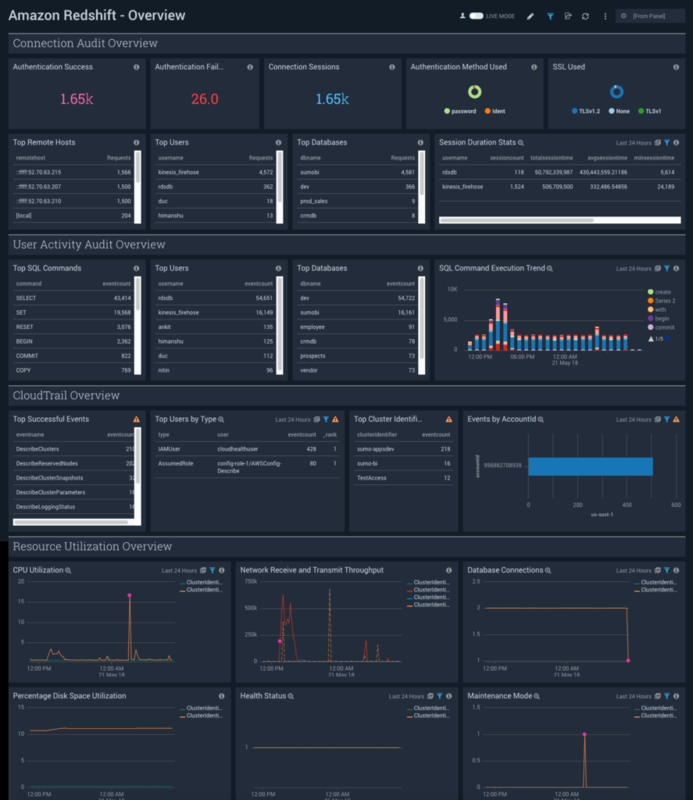 The preconfigured dashboards provide insight into created and deleted resources, messages, authorization failures, user activities, and error logs. Google Compute Engine is the Infrastructure as a Service component of Google Cloud Platform that delivers virtual machines running in Google’s data centers and worldwide fiber network. The Sumo Logic App for Google Compute Engine helps you monitor your infrastructure by providing preconfigured dashboards that allow you to view the activities, users, message severity of your Google Compute Engine infrastructure. The Sumo Logic app for Google Cloud Functions helps you monitor your usage of Google Cloud Functions. 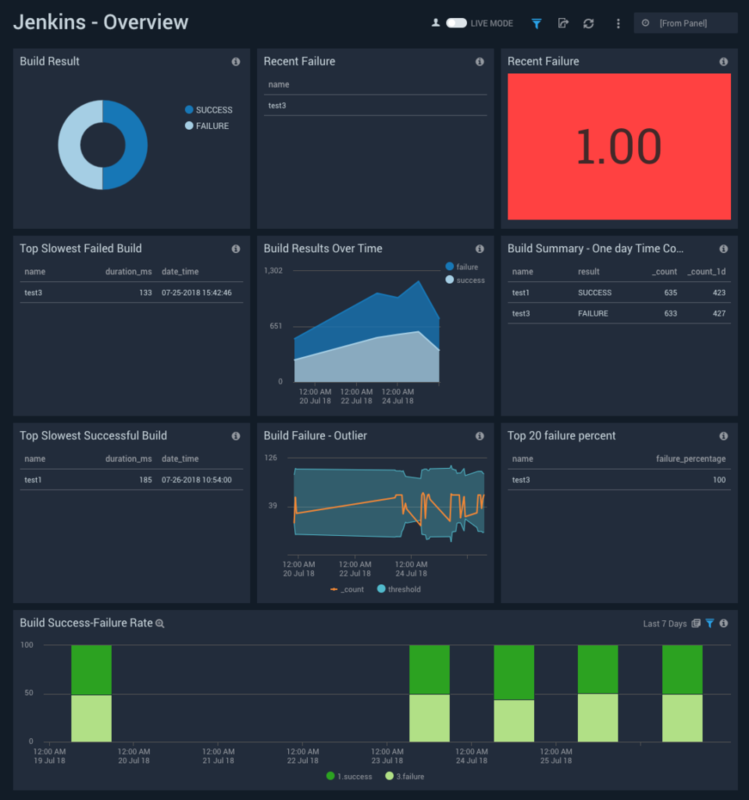 The preconfigured dashboards provide insight into function executions, operations, latency, errors, and failures. Autocomplete for dashboard filters allows for your Sumo Logic metadata or parsed fields to be available as pick options from filter dropdowns. Autocomplete will suggest available options in an alphabetized list as you type and provide you the first set of values when you enter your cursor into the filter field. This will make it easier for users to utilize dashboards across teams and more easily filter and find information while troubleshooting or exploring information. 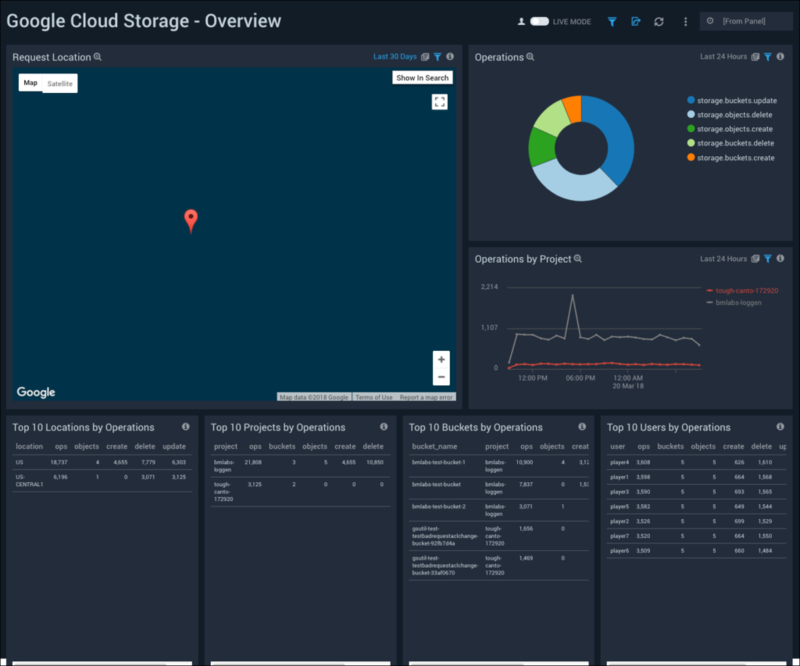 The Sumo Logic App for Google Cloud VPC provides visibility into the activities, traffic, metrics, and VPC flow in your GCP. 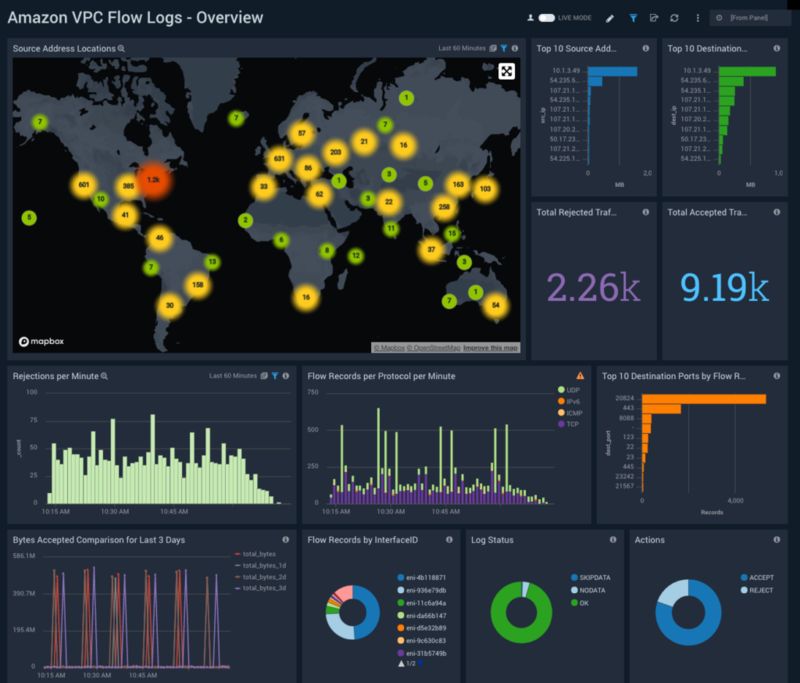 The preconfigured dashboards provide you details on the VPC flows, latency, traffic, source and destination IP addresses, ports, protocols, and messages. The Sumo Logic App for Google App Engine helps you monitor the activities in your App Engine. 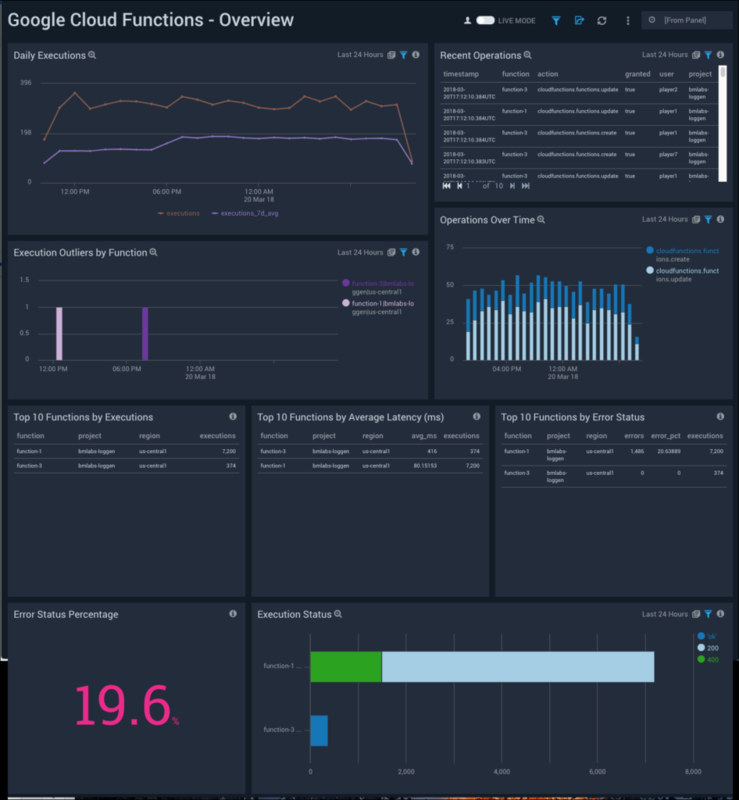 The preconfigured dashboards provide insight into the requests, applications, HTTP status codes, latency, and response time in your App Engine. The Sumo Logic App for Google Cloud IAM gives you visibility into the activities in your Cloud IAM. 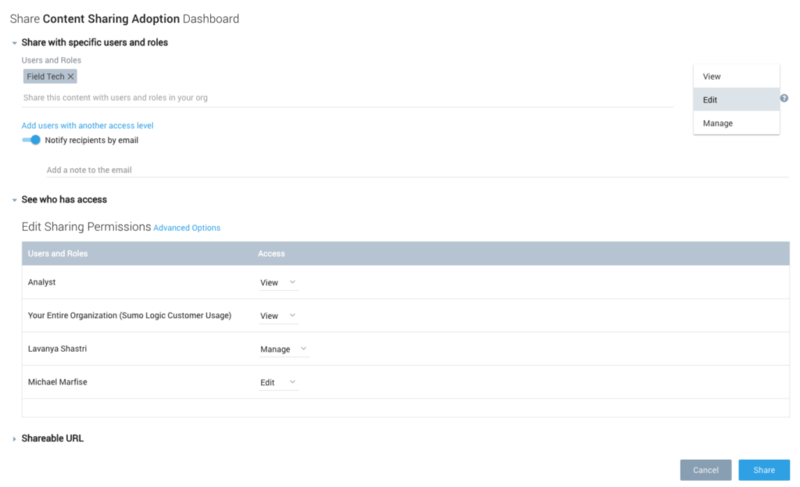 The preconfigured dashboards allow you to monitor the IAM project activities, operations, role activities, and policy changes. 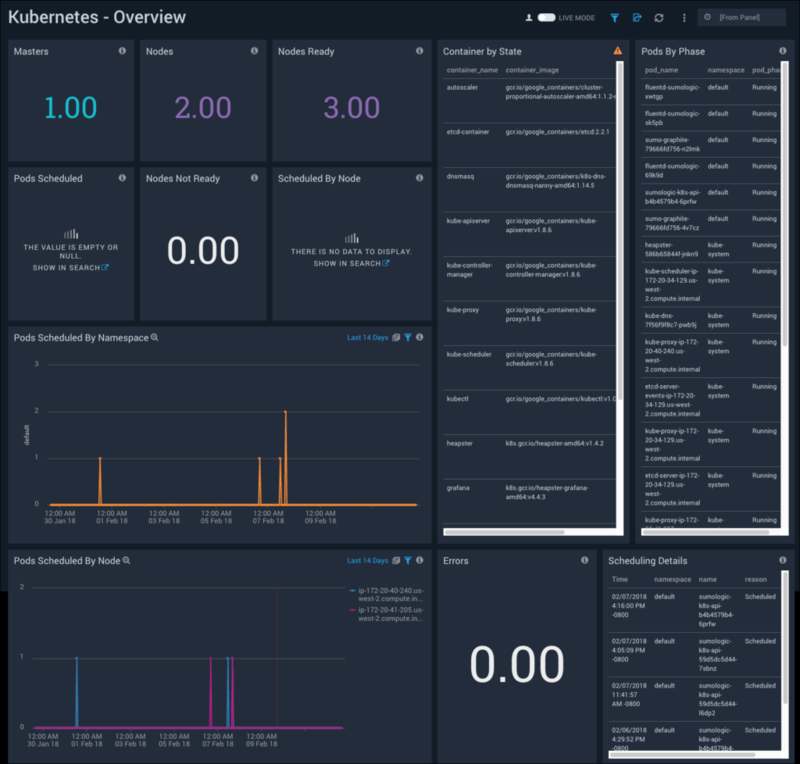 The Sumo Logic App for Kubernetes allows you to monitor Kubernetes deployments that are self-managed by open source tools such as Kops. 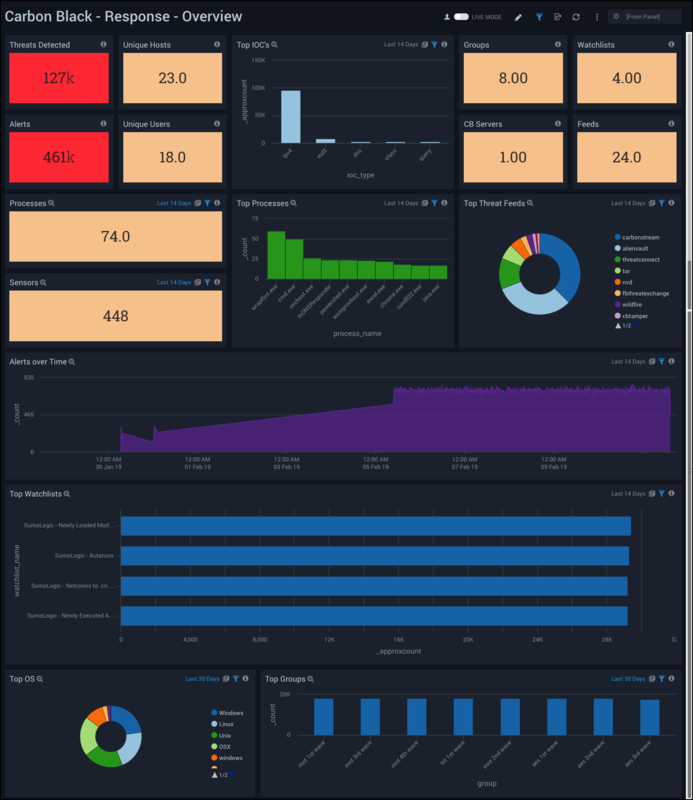 The preconfigured dashboards present resource-related metrics at the Kubernetes pod, cluster, and namespace level; and provide operational insight into Kubernetes components, including nodes, the API Server, the Controller Manager, the Kube System, and the Scheduler.